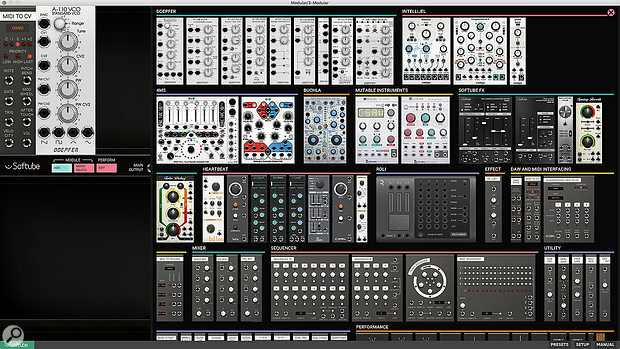 The fully loaded palette of modules. If you're Eurorack curious but short on space or cash — or simply allergic to 3.5mm patch cables — Softube's Modular might be for you. Softube's Modular plug-in has been around for a couple of years, but has recently enjoyed renewed attention with some exciting new modules and excellent price deals. Competition has also hotted up in the virtual modular market, so now seems like a good time to take a deeper look. Modular's concept is simple: it's a virtual Eurorack synth environment in a plug-in (VST, AU, AAX). It behaves in software just like its hardware equivalents and features movable modules, front-panel cable patching, and integration with your host DAW via virtual MIDI/CV/clock converters. Like other Eurorack sims, Modular seduces with the possibility of building a modular synth at a fraction of the cost of hardware, and with instant patch recall and the chance to start afresh whenever you want. But can software really capture the essence of the Eurorack experience? The basic Modular plug-in includes a selection of core modules to get you started. You can then expand your palette by purchasing additional individual modules. The base package is very inexpensive considering how much is included. You get all the modules you need to integrate with your DAW and external hardware, and a slew (sorry) of utilities, sequencers, mixers and performance panels. The core synthesis blocks — oscillators, envelope, LFO, VCA —are direct simulations of several ubiquitous Doepfer A-100 series modules and are also included as standard. A number of add-ons come from Softube themselves in the form of 'modularised' versions of their plug-in effects. This includes the TSAR-1 and Tube Delay, which just happen to be my go-to reverb and echo plug-ins. Softube have also broken out the separate voice modules from their drum machine plug-in Heartbeat. The Softube extras are not sold separately for Modular, they are 'Modular-ready', so if you buy the plug-ins you can also use them as modules. Perhaps the biggest appeal of Modular is the availability of several third-party add-ons that are faithful ports of real hardware modules. The range isn't huge, but it's very high quality, with some killer modules from Intellijel, Mutable Instruments, Buchla, 4ms and Doepfer. You might not be able to buy a Clouds hardware module any more, but you can now have it running as a plug-in. $89, expansion modules from $25.